Write this down: Theresa May is the Terminator. Sci-fi nerds will recall that underneath a hyperalloy combat chassis the Terminator is a microprocessor-controlled, fully armoured part-man (woman in this case), part-machine. It’s very tough but outside it is real living tissue. This is the T-800 model of course; nothing I have observed so far indicates to me that Theresa is a T-1000, which is made of liquid metal. 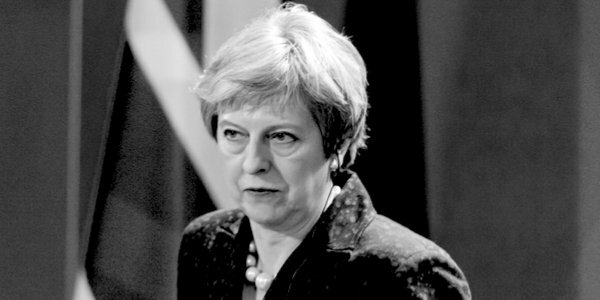 Like the Terminator, Prime Minister May is relentless, she is unstoppable and, crucially, she cannot be bargained with or reasoned with. This is why we are where we are. There is no point moaning about it – you have to understand her before you can begin to contemplate defeating her. Sometimes I think Theresa May is just very lucky – but then I remember some golfer said ‘I make my own luck’. And you have to admit, as I have said before, she won that last leadership election by closing out those fools Gove and Johnson, and she made it look easy. Just wait, she told herself. They’ll start squabbling and bickering and all I have to do is bide my time. This is exactly what she did – she made her own luck and before you knew it we had a Remainer as Prime Minister. Theresa May then made an error in calling an election no one wanted and ran a campaign that no one liked. The Conservatives lost seats – not that May lost hers, nor her Premiership. She had to go cap in hand to the DUP but none of this hurt May – the only thing it hurt was a proper Brexit. Yet again, May made her own luck. After this came Chequers, when it became clear to anyone who had eyes to see and ears to hear that the Brexit Theresa May was after was not the Brexit any voter had in mind when they voted to take back control. That was the time for the Mogg and the rest to make their move. They did not, and looking back, it was a fatal error. Finally, we have the Withdrawal Agreement – an agreement so awful, so dreadful (to use a very British word) that it would be tantamount to treason to sign it. Jacob Rees-Mogg and the other Brexiteers have tried to force a confidence vote but it seems they have fallen well short of the 48 letters needed to make this happen. I am a big fan of the Mogg, but it looks like neither he nor Steve Baker is the political tactical genius one must be to make this kind of thing happen. The Mogg, sadly, is no Cocaine Mitch, the Republican Senator and slayer of Democrats. The Mogg and Baker have done what they could and acted in the nation’s best interest. What they underestimated was the industrial-strength cowardliness of their fellow Brexiteers, in particular Priti Patel, Iain Duncan Smith and Sir Bernard Jenkin, who are all talk and no action. They have left Mogg and Baker high and dry. I’m not saying I would have done any better – but then I know I’m an amateur and so never went into politics. So now everything will come down to the ‘meaningful vote’ in Parliament expected next month. However with the DUP, Labour, the hard Brexiteers and some pro-European Conservatives united in opposition to the draft withdrawal agreement, it is hard to see how it will get through the Commons. Then we will leave on WTO terms, I hear you say. Not so fast. Many are saying that a no-deal Brexit would still have to be approved by Parliament. The government is required to table a motion setting out its plans in the event that it loses the meaningful vote and John Bercow, the Commons Speaker, has made clear to MPs that he would ensure they had the chance to express a view either as an amendment or through an opposition day or back-bench debate. As the days go past a second referendum looks more and more likely – perhaps one with two options: leaving on WTO rules or Remaining in the EU. The thing about ousting a Prime Minister or indeed making such a fundamental change to your governance such as leaving the European Union is that you have to want it. You have to really, really want it. Many Conservative MPs don’t want it – we have known this for a while. Recent rumours are that Conservative constituency associations do not want it enough either and fear any leadership change. So they will settle for this awful deal instead. The truth is that leaving the European Union was never going to be easy. Looking back, Farage leaving UKIP to go swanning around the US with Trump and Douglas Carswell resigning his seat saying the ‘job is now done’ looks premature at best and idiotic at worst. Where are these people now? On the radio and Twitter but not in the place that counts – Parliament. And what of the ‘people’ that we hear so much about and their ‘will’? Why are we really so afraid of a second referendum, this time about going out on WTO terms? Do ‘the people’ really want their sovereignty back? Do ‘the people’ really want to tell the overbearing technocrats, the madmen such as Guy Verhofstadt, that he can build his European army on the backs of other nations, but that the British Army is loyal not to the likes of Jean-Claude Juncker (God forbid), but to the Queen. Are ‘the people’ willing to endure another season of Project Fear by the BBC to get their borders back? Global and European elitists do not give up their power and privilege easily. It was foolish to believe otherwise.